Running is your life. You love the feeling of the wind on your skin as you run. The way the muscles in your body have to work hard as you run. Most of all you love the adrenaline rush that running gives you. But you have developed problems with your feet. Maybe you have flat feet or suffer from overpronation (these two problems often go hand in hand). Maybe you have just started running and have researched all the things that happen or can happen when someone runs a lot. Some may tell you the solution is to stop running, but that is a fallacy. The best solution is to purchase a pair of stability running shoes that will provide you with superior arch support, cushioning, and help you combat problems with flat feet or overpronation. In this article, you will be presented with a list of some of the best running shoes for flat feet that are suitable for men and women. These new shoe styles for 2019 come from well-known manufacturers like New Balance, Nike, ASICS, and Brooks just to name a few. In this list, you will find shoes that will support your feet and do it in style. With the Mizuno Wave Inspire running shoes, having flat feet or suffering from overpronation will not impede your ability to get out and keep fit. That is because these shoes are made to be everyday trainers and are specifically designed for men and women to get over with any foot issues that could be a hindrance to their running . Great arch support and lightweight stability shoes. You will find that the greatest areas of support come from the U4iC strobel boards and the double fan wave technology. The U4iC technology helps absorb the shock that your feet and body experience while running. It also offers increased durability for your footwear without adding extra weight to the shoes. These running shoes are purported to be thirty percent lighter than the most technologically advanced footwear on the market. Double wave technology is the aspect that will offer you more cushioning. This extra cushioning reduces the wear and tear on both your feet and your shoes, which helps keep your energy levels higher and keeps you on the go for a longer period of time. The insoles are removable so you can take them out when you do not need them or add orthotics if you need to. The Mizuno Wave Inspire 13 running shoes also have breathable uppers which will help keep your feet cooler and dry, as well as rubber in the forefront of the shoe to further increase the softness and durability of these shoes. Has a wider toe box than most running shoes and ideal for long distance running and marathons. In addition to all of these technological features, both the men’s and women’s version of the shoe come in a dazzling array of colors to suit all tastes. Nike shoes adorn the feet of athletes worldwide and for good reason. The name Nike is synonymous with quality, durability, and advanced technologies. The Nike Air Zoom Structure running shoe is a prime example of this. A superb trainer and running shoe. Excellent arch support for runners with low arches. These Nike stability shoes feature a midsole that has three times the density found in most running shoes. This feature provides you with foam that is on the inside of the midfoot as well as a foam wedge in the heel of the shoe. These shoes are also crafted for extreme breathability. This is accomplished with flymesh uppers and mesh inner sleeves. Your feet will stay cool and dry while providing you with shoes that fit securely. The laces are also made with flywire cables that further help to ensure that your shoes will fit just like a glove. The outsoles of the Nike Air Zoom running shoes come with two distinct features. There is a waffle outsole that provides you with superior traction on any running surface and rubber crash rails on the sides of the shoe for smoother transitions. These shoes are named for their ability to help you run faster. The Nike Air Zoom unit in the front of the shoe is responsive to your movements (which will help you run faster) while giving cushioning that provides comfort without adding too much bulk. The Nike Air Zoom Structure is available for men and women in a variety of colors. Anima Sana in corpore sano translates from Latin to a sound mind in a sound body. For those with flat feet or overpronation, ASICS has incorporated various technologies to keep your feet and body sound. These ASICS Stability shoes for both men and women does that in various ways. First, gel has been added to the rearfoot and forefoot of these running shoes to help with shock absorption. A support system that features a dual-density DuoMax midsole provides a more intense level of support and stability. Stride efficiency is increased with guidance line technology and gait efficiency and mid-foot structural integrity is improved with the guidance trusstic system. The midsole is made with spEVA materials for added durability and a higher return on energy. When donning these running shoes comfort is assured by way of the padded collar and tongue, removable foam insole and breathable fabric lining. The lining paired with the mesh uppers increases comfort by helping to keep your feet cooler and drier when running. Durable rubber outsoles ensure good traction and lace up fronts help further ensure that you can have the level of stability you require when wearing these ASICS shoes. The GT 1000 7 running shoes come in extra wide widths so these are ideal for runners looking for wide width running shoes. If you are searching for a good pair of stability running shoes, then the Saucony Guide 10 running shoes available for men and women must be considered. Shoe is ideal for the mild overpronator and provides adequate arch support. These running shoes boast many attractive features including an SRC landing zone which helps absorb shock, lightweight and durable dual-density EVA materials, and an EVERUN topsole that provides a cushioning effect that you will feel with every stride you take. 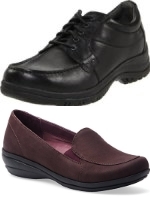 For added comfort, these shoes provide a breathable fabric lining, a thickly padded collar and tongue, and a removable insole that is great for those who use orthotics. Flexfilm is an additional technology featured in these shoes and it helps to provide even more support when running. The Saucony Guide 10 running shoes also have breathable mesh uppers for moisture control and lace up fronts so you can control exactly how these shoes fit you. The outsole has the ability to flex in three different ways to give you better contact with the ground. It also features injection blown rubber in specific areas of the shoes for more cushioning and carbon rubber for better traction and to help the shoes last a long time. Men or women with flat feet or a problem with overpronation will delight when wearing these stability running shoes. The icing on the cake is that you can find the Saucony Guide 10 shoes in different vibrant and attractive colors. ASICS continues to work hard to help keep your body sound with the Gel-Kayano 25 stability running shoes available for men and women. The Fluidfit and Fluidride feature of these shoes will be especially helpful for those suffering from flat feet or overpronation. Fluidfit technology boasts an upper mesh that stretches in four ways to help the shoes fit more snugly thus providing exceptional stability. Fluidride technology focuses on crafting a midsole that gives superior cushioning, shock absorption, and durability while being exceptionally lightweight. Gel in the rearfoot and forefoot of the shoe adds more cushioning and more shock absorption while the DuoMax systems adds more stability and support. ASICS has added an exoskeletal heel clutching system to add a third layer of exceptional fit and support. The GEL-Kayano running shoes also feature Comfordry X-40. The Comfordry X-40 is a sockliner that absorbs moisture and repels bacteria to keep your feet healthy and dry. The benefits do not stop here. These shoes feature ASICS proprietary guidance trusstic system that helps improve gait efficiency and a high abrasion rubber is also added in areas that are prone to wear and tear. Lace up fronts, a padded collar and tongue, and shoes that come in stunning colors all blend together to keep you running without pain and in grand style. Some customers have complained that the toe box of the Kayano is too narrow while others have purchased a wider width shoe size to get around this issue. The Brooks Adrenaline GTS running shoe has what it takes to help men and women who suffer from flat feet or overpronation. These Brooks stability shoes have a number of stunning features that include a midsole that Brooks has named progressive diagonal rollbar. This tri-density midsole is made specifically to assist with overpronation and helps you with every stride you take. A full-length crash pad is included in the shoe to give you extra cushioning and there is also a removable insole made of foam. Other features of these running shoes that are geared to provide you with more comfort are the tongue and collar with extra padding, the lining and mesh uppers that help keep your feet cool and repels moisture, and the Biomogo DNA which provides even more cushioning and is designed to be worn by men and women alike. The outsole of the Brooks Adrenaline GTS 17 features HPR plus and is made from Flextra rubber. HPR plus helps ensure that the areas that experience the most wear will last longer and the Flextra rubber gives extra support. These shoes are a dream for those with flat feet and overpronation. As with all the stability running shoes, the Brooks GTS come in different colors so you will look as good as you feel. New Balance does it again with a pair of stability running shoes suited for those with flat feet. One of the best running shoes with good arch support that will correct your overpronation issues. The New Balance 1260 has a midsole made of foam that is twenty-four percent lighter than standard shoes. The ABZORB crash pad functions to give you more stability in the heel and more control while running. The TPU T-beam shank is another feature that is useful for those who need more arch support and the Ortholite insole is removable and great to take out to put in orthotics or on days when less cushioning is needed. The mesh uppers of these stability running shoes are breathable to help prevent your feet from getting too hot and these shoes also include Fantomfit technology which helps to reduce the irritation that can occur when wearing some shoes. The lining of the 1260 running shoes is made of fabric with a collar and tongue that are lightly padded to give you more comfort. The lace up fronts allow you to control the fit and the heel is designed asymmetrically to make sure your feet do not slide around in your shoe as you run. Your feet will be cool, they will be cushioned, well supported and with the blown rubber outsole you will also have good traction while running. These shoes are available for both men and women and you can choose from lots of eye-catching colors. When you put on a pair of the Saucony Omni running shoes, you will get the special support you need for flat feet. Suitable for the mild to severe overpronator. Your feet will be supported by Sauc-Fit and support frame technologies. Sauc-Fit helps keep your midfoot stable in the shoe while the support frame provides you with further support. The Omni stability running shoe also features POWERGRID technology which provides you with a midsole that gives more energy and helps with shock absorption. You will not have to worry about keeping your feet cool and dry because these shoes are made with an interior the wicks away moisture. The insole is removable and made of foam which addresses the issue of extra cushioning or space for orthotics. The upper mesh is durable and breathable. The lace up fronts let you control the fit of your shoe and the rubber outsoles are made with iBR plus technology that will give you superior traction whether you are running indoors or outdoors. This technology also helps give you a shoe that is lightweight so you will not feet like you are lugging around weights on your feet. Saucony Omni stability shoes will support you and comfort you. You will be able to transcend any foot problem with the Brooks Transcend stability running shoes. As with the Brooks Adrenaline GTS , these shoes have a DNA midsole that is made for men and women and provides extra cushioning and support. Can help runners with Plantar Fasciitis issues These made in USA running shoes have a special guide rail in the midsole that gives even more support which helps you move more naturally when you run. An insole board is inserted into the shoes to give you more flexibility and more comfort. 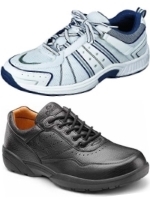 An additional level of comfort is provided by the foam footbed, collar and tongue that is heavily padded, and the lining of the shoe which is made of soft fabric. The mesh upper is breathable and contains materials that help manage moisture. The outsole boasts HPR plus technology which has extra rubber placed in areas that experience more wear and tear. The outsole also includes ideal pressure zones in the heel and front of the shoe which better helps you distribute your weight. 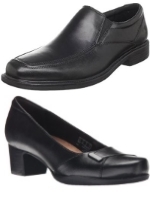 The lace up fronts allow you to adjust the shoes so they will give you the fit you need. The Transcend 3 running shoe has the support you need to help with your flat feet or overpronation problems. Men and women with flat feet or overpronation issues can rejoice because New Balance 870 v4 stability running shoes are made especially for you. These running shoes feature ABZORB crash pad technology which will give you extra cushioning in the heel and forefront of the shoe and reduce the shock that occurs while running. The padded tongue and collar and soft inner lining further accentuate your comfort while running. The REVlite midsole helps make these running shoes lightweight and responsive to your every movement. These shoes are extremely durable because they are made with a blown rubber outsole from Ndurance rubber in areas of the shoe that tend to wear out quickly. This gives both durability and stability and it is exactly what you need when you have foot problems. The 870v4 running shoe also has a breathable mesh upper that helps control moisture and this is a must for runners. The lace up fronts on the New Balance 870v4 running shoe will give you added stability and control because you can make the shoes as tight or as loose as you need to. You can stand out from the crowd with these New Balance running shoes without having to suffer physically for being stylish. Available in regular and wide widths. When you are running, you want a smooth ride and you do not want foot problems to get in the way of that ride. This list of stability running shoes will help you if you need more arch support, have flat feet or overpronation problems. Do not let foot problems stand in your way, get out and run.